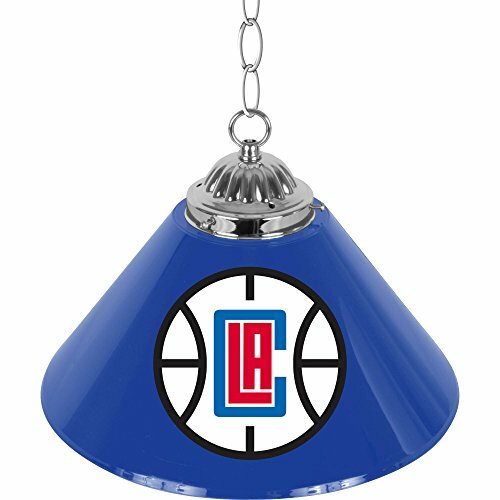 NBA Los Angeles Clippers Single Shade Gameroom Lamp, 14"
Illuminate your game room, garage or collection with an officially licensed 14 inch Single Shade Bar Lamp. This premium lighting fixture looks great on or off with officially licensed logos on both sides of the polyresin shade. The shade is accented by polished metal hardware and chain. Over nine feet of cord provides many hanging options. Brighten up your favorite area with this one of a kind officially licensed single shade bar lamp. View More In Tools & Home Improvement. If you have any questions about this product by Trademark Gameroom, contact us by completing and submitting the form below. If you are looking for a specif part number, please include it with your message. NBA Philadelphia 76ers Single Shade Gameroom Lamp, 14"
NBA Denver Nuggets Single Shade Gameroom Lamp, 14"
NBA Cleveland Cavaliers Tiffany Gameroom Lamp, 40"
NBA Washington Wizards Single Shade Gameroom Lamp, 14"
NBA Portland Trail Blazers Single Shade Gameroom Lamp, 14"